A vanitas painting is a particular style of still life that was immensely popular in the Netherlands beginning in the 17th century. 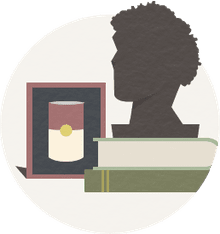 The style often includes with worldly objects such as books and wine and you will find quite a few skulls on the still life table. Its intent is to remind viewers of their own mortality and the futility of worldly pursuits. The word vanitas is Latin for "vanity" and that is the idea behind a vanitas painting. They were created to remind us that our vanity or material possessions and pursuits do not preclude us from death, which is inevitable. The phrase comes to us courtesy of a biblical passage in Ecclesiastes. In it, the Hebrew word "hevel" was incorrectly taken to mean "vanity of vanities." But for this slight mistranslation, the term would rightfully be known as a "vapor painting," signifying a transitory state. 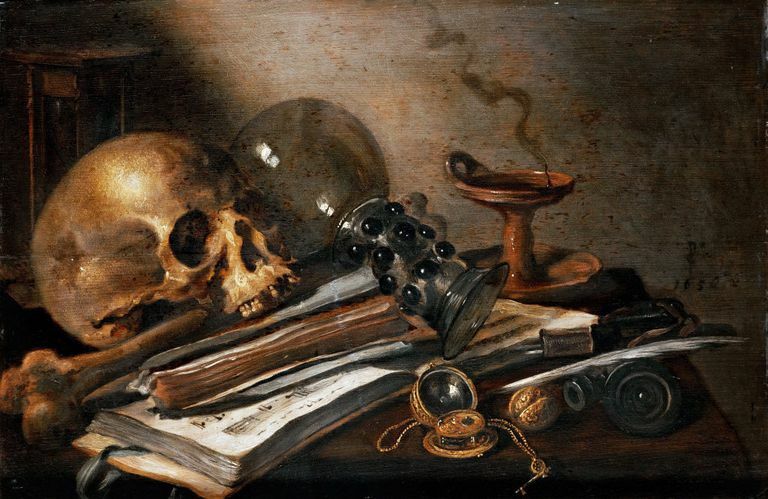 A vanitas painting, while possibly containing lovely objects, always included some reference to man's mortality. Most often, this is a human skull (with or without other bones), but items like burning candles, soap bubbles and decaying flowers may be used for this purpose as well. Other objects are placed in the still life to symbolize the various types of worldly pursuits that tempt men. For example, secular knowledge like that found in the arts and sciences may be depicted by books, maps, or instruments. Wealth and power have symbols like gold, jewelry, and precious trinkets while fabrics, goblets, and pipes might represent earthly pleasures. Beyond the skull to depict impermanence, a vanitas painting may include references to time, such as a watch or hourglass. It may use decaying flowers or rotting food for the purpose as well. In some paintings, the idea of the resurrection is included as well. Among these, you might find sprigs of ivy and laurel or ears of corn. To add to the symbolism, you will find vanitas paintings with the subjects placed in disarray compared to other, very tidy, still life art. This is designed to represent the chaos that materialism can add to a pious life. Vanitas is very similar to another type of still life painting, known as memento mori. Latin for "remember you must die," this style tended to include only those objects that remind us of death and refrained from using the materialistic symbols. Vanitas paintings were meant not only as works of art, they also to carry an important moral message. They are designed to remind us that the trivial pleasures of life are abruptly and permanently wiped out by death. It is doubtful that this genre would have been popular had the Counter-Reformation and Calvinism not propelled it into the limelight. Both movements—one Catholic, the other Protestant—occurred at the same time as vanitas paintings were becoming popular. Like the symbolic art, the two religious efforts emphasized the devaluing of possessions and success in this world. They instead, focused believers on their relationship with God in preparation for the afterlife. The primary period of vanitas paintings lasted from 1550 through around 1650. They began as still lifes painted on the backside of portraits and evolved into featured works of art. The movement was centered around the Dutch city of Leiden, a Protestant stronghold, though it was popular throughout the Netherlands and in parts of France and Spain. In the beginning of the movement, the work was very dark and gloomy. Toward the end of the period, however, it did lighten up a bit. Considered a signature genre in Dutch Baroque art, a number of artists were famous for their vanitas work. These include Dutch painters like David Bailly (1584–1657), Harmen van Steenwyck (1612–1656), and Willem Claesz Heda (1594–1681). Some French painters worked in vanitas as well, the best-known of which was Jean Chardin (1699–1779). Many of these vanitas paintings are considered great works of art today. You can also find a number of modern artists working in this style. Yet, many people wonder at the popularity of vanitas paintings by collectors. After all, doesn't the painting itself become a symbol of vanitas?